Boiling eggs require around 10-15 minutes in some water and then cover with plate to steep. 1. 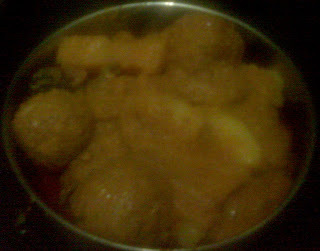 Drain out all excess water from koftas and keep in a bowl. 2. Add all the kofta ingredients and mix them nicely to remove any thick parts. Knead like a dough. 3. Oil a plate and then some water in a cup. 4. Cut some onions thinly and then mix them so they are separated. Also cut two potatoes into half each and then make four slices of each and keep in a water with some salt. 5. Take 3 cooking spoon oil in a cooker and add thin onions and let them be golden brown and then take it out and seperate so they harden. 6. Add small cardomons in the oil and then the kofta masala into it. Add tej patta, dalchinni and big cardomon along with salt at this time. Alow masala to cook. Do so by keep adding water once a while. This way it will take around 15 minutes. In meantime prepare koftas. 7. Wet your hand with water and take some kofta mixture and beat is nicely and then add egg or raisin in it and the close it nicely by beating softly. Keep using water and roll it out and keep aside. Make all koftas like that. 8. For nargisi kofta, one can use whole boiled egg or half / four pieces of it to fill inside kofta and for normal kofta one can use 4-5 kishmish. If one relishes ghee one can also put a drop of ghee with raisins inside kofta. 9. 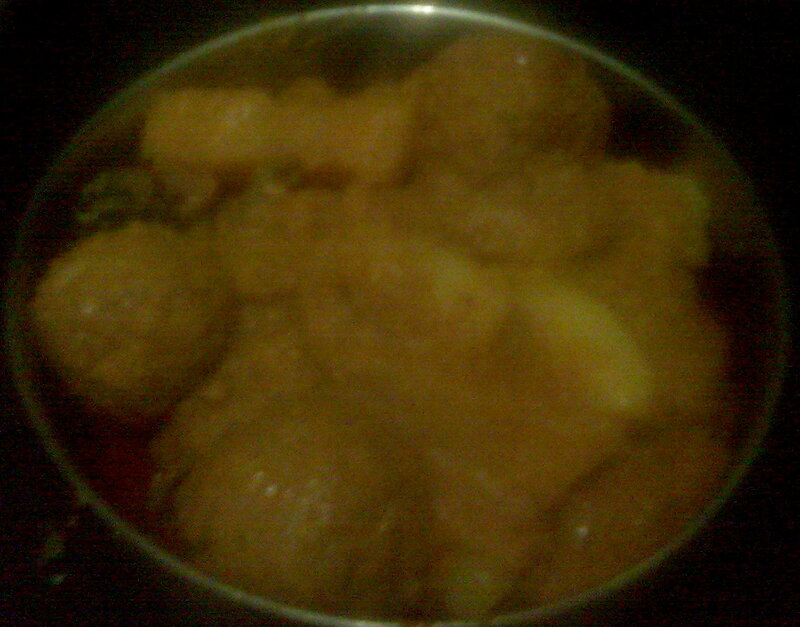 Once masala is done add about 1-2 cups of water to it and then slowly add koftas to it. Make distances and make place for all. Once they are added and water should be just at level of koftas and boiling, close the lid of cooker. Let cooker give about 5-6 whistles on slow flame. 10. Once steam releases, add khaskas to it and crush fried onions with some curry masala and kevda and add it to koftas masala and then add enough water to be made into curry. Water should be just little above the koftas. 11. Close the lid and give about 1-2 whistles. 12. Nargisi koftas are ready. One can decorate with cut fresh coriander leaves. Note: if one wants curry and water gets evaporated in whistles one can boil water and add in curry and then boil the mixture for a minute and that works too. Use about 4-5 tablespoon seeds to make khaskas paste and about 1/3 cup of channa for making that paste and one can save to use later. Don't add too much channa or it makes koftas hard. Garam masala ingredients- roast a handful cumin deeds (jeera), black pepper (kali mirj), some cloves(laung), 1-2 cinnamon(dalchini) , some big and small cardomon(elaichi ) and then mix in a dry blender and store. Mint (pudina) powder used was made by drying fresh pudina leaves in sun or in air for some days and then smashing them and storing. One can also roast black pepper as well cumin seeds (seperately) and mix in blender and store for days. 1. One can use kofta mixture to make seekh kabab on a tandoor. 2. If raw papaya(kacha papita) is available, take a small piece and mix in a blender and add in the kofta mixture, it acts as a binding agent for making Gulati (shammi and seekh) kababs using raw kheema. Never add it in koftas or they will scatter. 3. Use thin kheema meat for koftas or else boil the mixture, for 5-6 whistles and grind using sil batta and then add in curry when curry is completely done.